Erosion is the action of surface processes, such as water flow or wind, that remove soil, rock, or dissolved material from one location on the earth’s crust, then transport it to another location. The rate that something erodes can be impacted by many factors including storm frequency, type of soil, ground cover, and rain intensity. Land development can often have a detrimental effect on the rate of soil erosion due to concentrated areas of storm runoff and the increased activity involved in clearing, grading and excavating land for development. 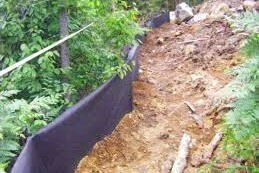 Even after construction is complete, property owners may notice erosion in steeper areas that are susceptible to excessive rainfall. Both residential and commercial properties often encounter problems with erosion at storm water pipe outlets, creeks, rivers, detention ponds, retention ponds as well as other areas that do not have ample vegetative cover. The frequent cause of sediment erosion is the failure of the developer or builder to employ the Best Management Practices, which can prevent expensive property damage. During construction, the soil is more susceptible to being transported by wind or water due to the lack of ground cover. As the soil absorbs rainfall, it gradually dissolves and gravity carries the mixture downstream to the lowest elevation, causing extensive property damage. Silt fencing, hay bales, and establishing suitable ground cover are all common BMPs that Civilogistix employ in our projects to protect sites. Erosion is becoming an increasing problem in development, and can cause serious implications. Failure to comply with the NPDES Permit and the associated Erosion Sediment and Pollution Control Plan are violations of both the Georgia Erosion and Sedimentation Act and Georgia Water Quality Control Act, which are serious offenses. Civilogistix has expert erosion control professionals who will perform site inspections to determine the cause of the erosion. We will also come up with the most cost-effective solution to maintain erosion control for years to come.